The E-137 Color Bar from Eliminator Lighting is a simple, chasing color wash for clubs and DJs. 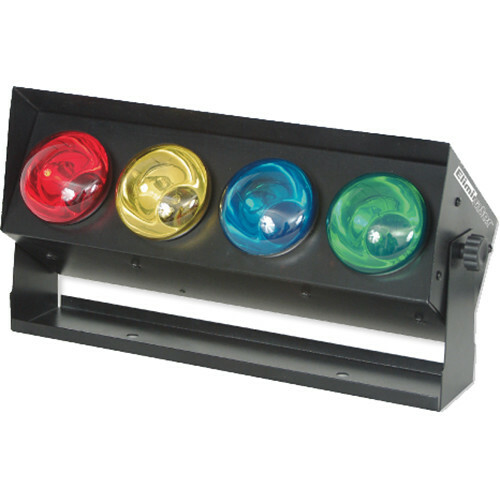 It features 4 colored bulbs (red, yellow, blue, green), an internal microphone, chase speed control, and a sound sensitivity knob, allowing the beams to chase at your control. The unit can be attached to trussing using a clamp and should only be plugged into a standard 110V wall outlet. After plugging the unit in, turn the sound sensitivity knob 20°, and set the chase speed knob to the desired position. The fixture will then be in sound-active mode, and will react to the beat of the music via the internal microphone. Turning the sensitivity knob clockwise will make the unit more sensitive to sound and vice versa, allowing for adjustments so that the beams will chase to the beat of the music. Box Dimensions (LxWxH) 18.6 x 11.1 x 7.1"
Does this plug in to a wall socket? And does it alternate flashing colored lights? Yes, the Eliminator Lighting E-137 Color Bar will plug into a standard household AC outlet. The colors display one at a time, alternating from red, to yellow, to blue, to green, repeating indefinitely.